What’s a better way to kick off the New Year than by giving tips on how to improve your overall quality of sleep? 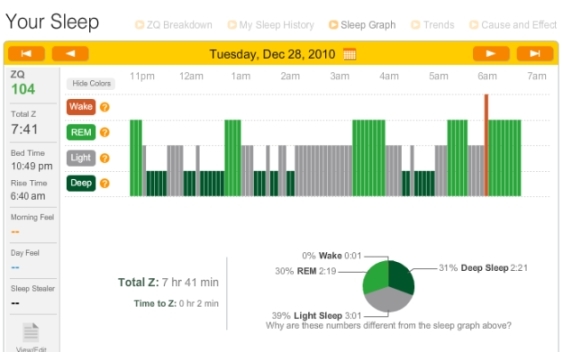 I decided to write this post as a mini-review of the Zeo Personal Sleep Coach and share some open source tools and APIs to help with saving your Zeo data for your own personal analysis. In retrospect, 2010 was a pivotal year for me since I first learned about some amazing new technology gadgets that help you keep track of your overall health and well-being. Last February I discovered the WiThings scale that will automatically track your weight and BMI, and will upload your data online so you can set goals and visually see how you are progressing. Then, in April I received my FitBit and have been consistently using it to track my overall fitness activity – calories burned, miles walked, activity level, etc. The thing that I love about these gadgets is that they “just work”: simply stepping on scale, or wearing a little gadget on your belt will help produce interesting sets of data and visual graphs that can help guide you to take action to improve your health. A few months ago I discovered another amazing device called the Zeo Personal Sleep Coach that will actually track how well you’re sleeping, provide detailed data and visual feedback, and give coaching tips to improve your overall quality of sleep. 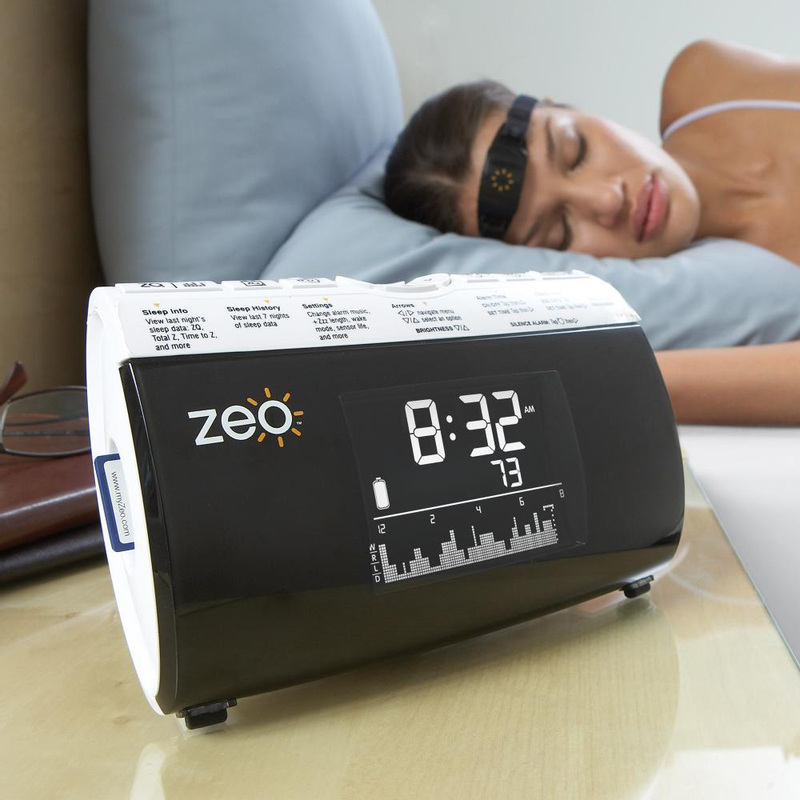 When you wake up and place the headband back on the bedside display, the Zeo will provide you with an overall sleep score (ZQ) that is based on your sleep quality and quantity. Your base score is your total sleeping time, combined with restorative sleep (Deep & REM) and disrupted sleep (wakeups, total wake time). Think of the score as your overall grade for how well you slept. I was surprised to learn that the average score for my age group is a ZQ score of 77. Since I started using the Zeo in November, my sleep score has been averaging a ZQ of 98. This is where the Zeo data can get interesting. This particular graph will not only show what time you went to bed and woke up, but also the total time it took to fall to sleep and a detailed breakdown of what sleep phase you were in throughout the night! Reviewing this graph can provide some telling feedback on how different factors may impact your night’s sleep: going to bed too early/late, stress (a racing mind), too much caffeine or alcohol, working out too late in the evening, etc. The sleep history graph will show key information (ZQ score, total sleep time, deep sleep/rem sleep, etc.) for different time intervals (daily, weekly, monthly). Again, being able to use this data to see trends in your sleeping patterns can provide some useful feedback on how to be more conscious of what’s impacting your quality of sleep. For a good review and video of the Zeo, I’d recommend reading the WallStreet Journal article from last year (note the price for the Zeo is now $199.95 USD and available at retailers like Brookstone & Sharper image). And, for another recommended review with some detailed info on how the Zeo actually works check out Ryan Hurd’s review and some peer-reviewed literature on the science behind Zeo. Now, this is where the post gets a little technical (and exciting)! The thing that I *really* like about the Zeo is their willingness to give you as much access to your sleep data as possible and embracing open source as a compliment to their commercial offering. How are they doing this? Zeo issued a press release back in June announcing their new open API to allow 3rd party companies and individual developers complete access to their sleep data. The published API offers developers the ability to register and signup for an API Key, and provides a comprehensive REST API (using both JSON and XML) so 3rd party libraries can be developed. Zeo currently offers some sample code using the API in a variety of languages (Perl, PHP, Java, etc.) and a fully working Ruby libarary developed by DailyBurn. In order to help ease my own effort to download data and help other developers, I decided to create my own OO Perl library similar to the one I initially created for Fitbit back in May. Unlike the FitBit libary which is somewhat unofficial (Fitbit does not offer ‘published’ API for developers), the Zeo Perl library has been fully tested against the published API, and any future changes by Zeo can be easily incorporated in the the library. The Perl API (WebService::Zeo) is now hosted on GitHub at http://github.com/ericblue/Perl-Zeo-API. In the near future this library will also be made available on CPAN. This module provides an OO (Object-Oriented) library that currently supports all major services in the REST catalog (methods for getting sleep averages, detailed sleep data based on exact dates and ranges, and pagination to step through the sleep records). Zeo Data Decoder Library – A version of software and a library that enables a user to decode Zeo sleep data stored on a memory card without uploading data to mySleep.myZeo.com. Zeo Raw Data Library – A version of software and a library that enables a user to decode Zeo sleep data and raw signal data in real time using the auxiliary serial port located on the back of Zeo. 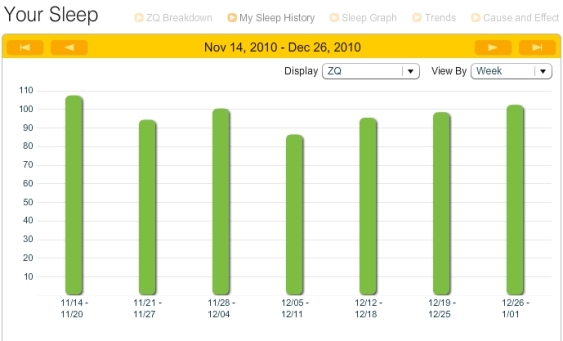 Integrate Zeo sleep data into a website that tracks your weight, nutrition, and exercise. Create a desktop application to view and process Zeo sleep data. Build a lucid dreaming system to notify you when you are in REM sleep and alert you using a sound. Use Zeo while you are awake to measure meditation. Overall, I’m very pleased with the Zeo so far and would highly recommend to anybody interested in improving their sleep quality. And, for the “hackers” out there, the open source offering provides some great tools to access all of your sleep data and analyze in unique and interesting ways. 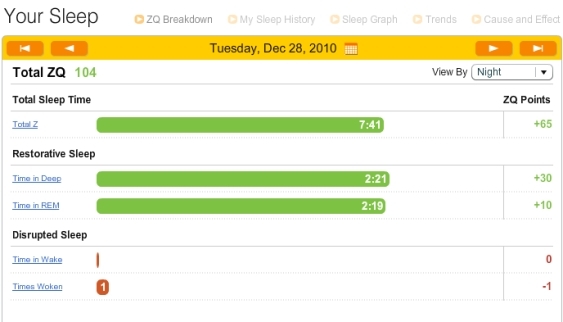 Happy 2011, and I wish all of you restful sleep and a healthy ZQ score! few months passed… how would you rate your Zeo experience? Did your ZQ score improve? Is your sleep subjectively better? Does it always wake you up in the well rested and alert state? Sorry for the delayed response. Overall, I’m really happy with the Zeo. I think my ZQ score has been roughly holding (~100 avg, low is 80-90 highs are 115-118). But, the key thing I discovered is that if I go a week or more without monitoring I feel as if my quality of sleep isn’t as high. The shear act of monitoring/observing is making me aware of choices that impact sleep (time to bed, overworking, etc.). I have discovered that I have a very high amount of REM and Deep sleep. My averages are actually above the high end for my age group. Even with only 5-6 hours of sleep I still get more REM than the average person. I’m not sure why that is, and need to dig deeper. I really don’t use the Zeo for waking me. For the past 18 months I’ve tried to wake naturally and it’s worked out very well. Is there a way for this device to give you some sort of signal when you are in REM? 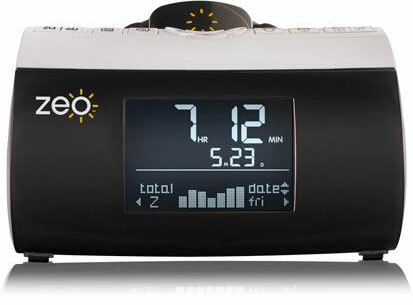 Alot of lucid dreaming is done through REM, and it would be cool if the Zeo bedside could assist in telling me i am in REM withouth waking up. That makes me wonder if i should get the Zeo Bedside or the Moblie version. I think its able to provide signals of when your in REM state – Rob, not sure if the mobile version provides REM state. I need the Zeo Firmware 2.6.3R or 2.6.30 or instructions on how to get to them on the MyZeo site — “registration” page not working anymore. Will take what I can get — zip files, webpages with links, or webpages with downloads. I haven’t personally verified the firmware, but there’s a thread over a the QS forums where somebody has attached a copy of the 2.6.30 firmware. Check out.